Futomaki Sushi Roll (太巻き) is is a large cylindrical piece, with nori on the outside. 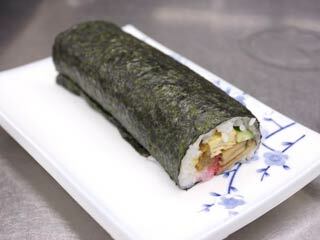 A typical futomaki is three or four centimeters (1.5 in) in diameter. They are often made with two or three fillings that are chosen for their complementary tastes and colors. During the Setsubun festival, it is traditional in Kansai to eat uncut futomaki in its cylindrical form, where it is particularly called ehou-maki ( 恵方巻, lit. happy direction rolls). Futomaki is often vegetarian, but may include non-vegetarian toppings such as tiny fish roe and chopped tuna. First, put Kanpyo and Shiitake into water to wet them back. It will take over 30 min. so do this at the beginning. Let's make Sushi Rice. This time, we use Sushi vinegar. Prepare 500g of rice and add 50cc of Sushi vinegar. Shiitake and Kanpyo are wet back now. Remove all water of Kanpyo and wash it with water. Add little salt and wash it again. Add 800cc of the remained water of Shiitake into a pan. Add one large table spoon of Soy Sauce. Add one large table spoon of Sugar. Then add all Shiitake and Kanpyo and boil them. Boil them all the way until most of the soup is gone. While waiting for boiling, let's cut Dashimaki Tamago. Cut it 1cm wide stick shape. Shiitake and Kanpyo are ready. Remove them over a dish and cool them down. Cut cucumber 1cm wide stick shape. Let's roll. This is the roller, made from bamboo. There is flat face and rounded face. When you use it, use flat face. Nori has also flat face and rough face. Put flat face down like this. First rice. Put them evenly all over Nori. Cut top and bottom, then that's it.